Pet Remedy is a natural de-stresssing and calming blend of oils. It contains an unique blend of Valerian, Vetivert, Sweet Basil and Sage. It is cost-effective, a prescription is not required and it can be used for other animals. How does pet remedy work? Pet Remedy works by enhancing the production of GABA (Gamma Amino Butyric Acid). GABA is a calming neurotransmitter. The Pet Remedy blend ‘tricks’ the nerve cells that are fired up by adrenaline into believing they are receiving a calming message from the brain. Does the product sedate my dog? Pet Remedy is diffused in such a low dosage that it does not sedate. How is Pet Remedy administered? 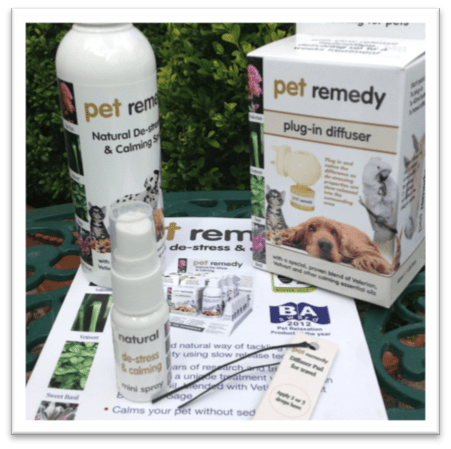 Pet Remedy is available in a plug-in diffuser, a hanging travel diffuser (eg for the car) and a spray. How much does Pet Remedy cost? How can I purchase Pet Remedy? Contemplating Canines are suppliers of Pet Remedy. If you are considering a purchase, please contact us and we will discuss your dog’s requirements. A FREE initial assessment is available for each purchase of Pet Remedy. If, however, a full behavioural consultation is required you will be advised.